Call for Abstracts: At What Point Managed Retreat? 1. Call for Abstracts: At What Point Managed Retreat? Please consider submitting an abstract for this conference on managed retreat from coastal areas, which will take place from the evening of the 19th until the 21st of June 2019. The deadline for submissions is 1 February 2019. Note that papers are welcome on retreat issues in other contexts, such as the urban-wildland interface, where fire risks are increasing. 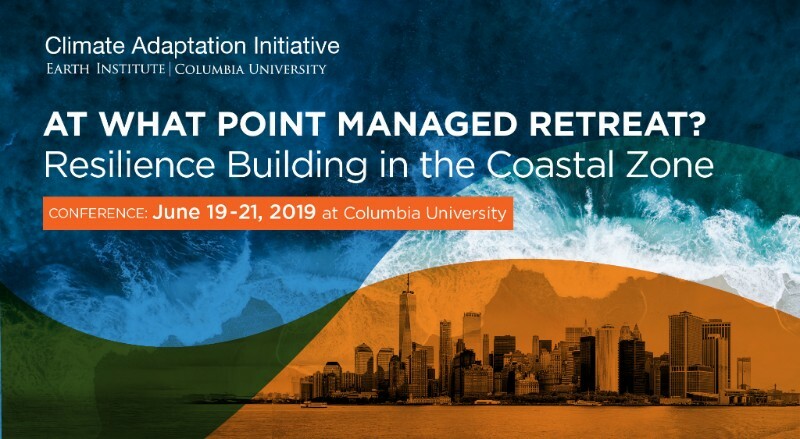 Organized by the Climate Adaptation Initiative at Columbia University's Earth Institute, this conference will address a range of issues facing coastal communities in the United States and around the world as sea levels rise and coastal flooding becomes more frequent and intense. The science around retreat is still ill-defined, and policy discussions remain contentious. This conference will bring together thought leaders on this topic to advance the science and policy dialogue. The conference will be of interest to academics, planners, practitioners, and industry representatives from sectors such as real estate and insurance. Abstracts are welcome from researchers and those involved in policy, planning, or corporate foresight activities. While the primary focus is expected to be on coastal issues, there will be additional sessions focused on other hazards facing diverse regions, such as drought, fire, heat stress, and inland flooding. Submit your abstract by February 1, 2019. More details on the topics can be found on the conference website. This website will be updated as more information becomes available. Please feel free to share this announcement with colleagues. Copyright © 2018 Earth Institute, Columbia University, All rights reserved. You are receiving this email because you've asked to hear more about events at the Earth Institute.